One of the most time-consuming parts of the writing process is editing, and everyone in the creative field knows that editing is essential to create a powerful, final product. But RivetAI is the latest software company that helps creatives save time during the editing process through a suite of AI-based tools. RiverAI’s products were originally developed to be used by Hollywood film crews, but it is now launching its product for widespread, general use! 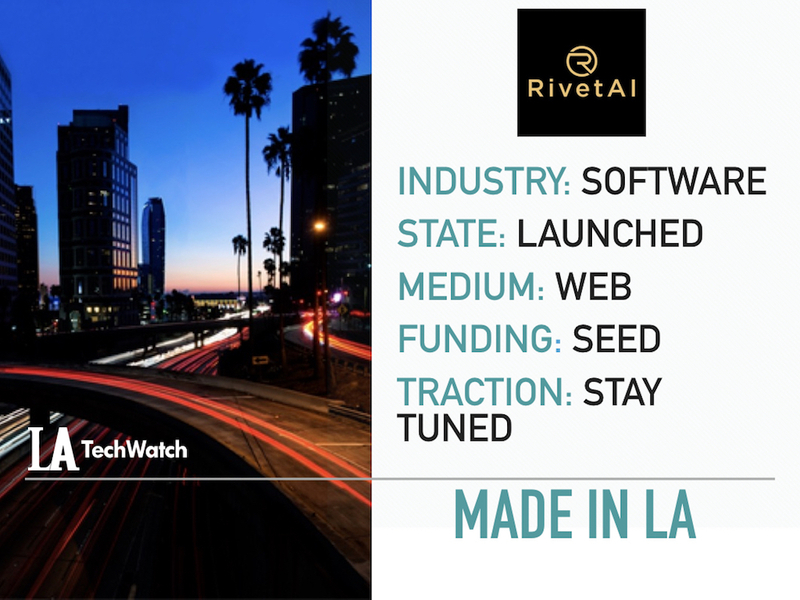 LA TechWatch spoke with CEO and founder Debajyoti Ray to discuss how LA and Hollywood have helped sculpt this new, revolutionary product. Tell us about RivetAI’s product. RivetAI is a suite of AI-based tools for anyone that makes content. We cut our teeth in Hollywood, helping line producers and everyone behind the screen get their job done and we are now launching for everyone else. Today, people use pen, paper, and highlighters to iterate on scripts, track budgets, and execute a variety of burdensome and chaotic tasks in the creative process. We’re overhauling this with machine learning-powered software to automate time-consuming tasks and empower creatives to do more. What’s so powerful is how we affect a wide variety of jobs and roles. Screenwriters can now pitch their work much more effectively; line producers can take on more jobs; production studios can streamline the RFP-creation process; and corporations can create compelling in-house and social content. What market is RivetAI attacking and how big is it? We’re looking at the industries of digital video production, content marketing, and film — some $473B in total revenues. This is a Software-as-a-Service (SaaS) approach. Why is content creation well suited to be facilitated by AI? First, it all boils down to the story in a script, to written language. We can tap into the universe of written stories, scripts, and dialogues to train AI to understand natural language. Second, the creative process is littered with tactical, time-intensive tasks that can be automated. Prior to RivetAI, I was CTO at End Cue, a hybrid film production and software company. Working there, I saw firsthand the problems that line producers, production assistants, and other film crew members face behind the scenes. It’s been instrumental to our success. It’s where we gained our understanding of the problems besetting the best storytellers in the world and tapped into the best AI talent, from companies like SpaceX and universities like Caltech. We’d like to grow our users among producers and sign notable customers outside of entertainment and demonstrate how Hollywood-grade AI can help everyone be better storytellers. We would love to talk to investors with know-how in media and entertainment who clearly see how AI can transform the entire content creation industry. It means belonging to a community of some of the smartest and most driven people on the planet, people who are driven by a passion to inspire, enrich and entertain. What else can be done to promote early-stage entrepreneurship in Los Angeles? Established and successful entrepreneurs can help invigorate innovation by engaging with the Meetup community and generally opening their doors to those who are less experienced. Personally, I’ve seen the fruits of such labor in Vancouver where I’ve helped cultivate an AI-focused filmmaking community. What is your favorite LA bar, when you need to kick back and relax? The Velvet Lounge, a speakeasy inside the Culver Hotel with great music and cocktails!